Born into a Baptist family, her parents were married by Reverend Charles D. Reed of the Calvary Baptist Church. Ball "remarried" Desi Arnaz in a Catholic ceremony June 19th, 1949 but she herself never converted to the faith. For a short time also Ball attended Marble Collegiate Church (Dutch Reform), run by Norman Vincent Peale, but never considered herself a member of the Dutch Reformed Church. In her own words, "It was a beautiful ceremony and I believed in it. At the time, I seriously intended to become a Catholic. I took instruction for a long time, but lost the inspiration when I realized that Catholicism did not seem to help Desi in his life." Her second husband, Gary Morton, was a Jew. 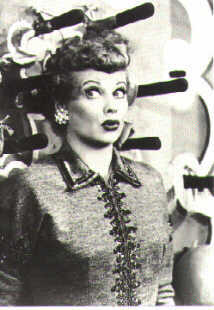 See Stefan Kanfer, Ball of Fire: The Tumultuous Life and Comic Art of Lucille Ball (2003). Registered as a Communist in 1936 to placate her grandfather.